The Galaxy S6 and S6 Edge are the flagship device from the company and in spite of being the top end phones they are prone to getting stuck or becoming frozen while in use. If this had happened with the earlier devices you would have easily removed the battery and replaced it, but it is not the case in this device as there is no removable battery in the Galaxy S6 and S6 Edge. So there has to be another way to get your Frozen or unresponsive Galaxy S6 to work normally and Samsung has already include a feature to cope with this along with the powerful features like the 5.1 inch Quad-HD display, Octa-core processor, aluminium edges and all glass design. So the only solution is to do a Hard Reset of your Galaxy S6 or S6 Edge. Samsung has taken the help of the Volume buttons and the Power buttons which are placed on the side of the devices to help you Reset or Reboot your device. 1. On the Right side of your Samsung Galaxy S6 you will find the Volume and the Power buttons. 2. You have to press and hold the Volume Down and the Power buttons at the same time for a period of Seven seconds if your device is Frozen or Unresponsive it will revert back to normal and you can use your device normally again. 3. Sometimes the device might reboot to the new maintenance mode if it is for the first time you are using this Reboot feature. The maintenance mode looks like the one shown in the image above, here you will be getting various options from which you have choose the necessary. 4. 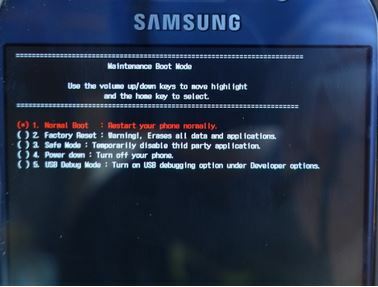 From the options shown there you have to choose the first option which is “Normal Boot” to get your phone to restart normally. 5. You can scroll through the options by using the Volume buttons and select the required option by using the Home button. 6. If the cause for the Galaxy S6 becoming Frozen or Unresponsive is any third party apps which you might have installed on your device you should select “Safe Mode” option which will Temporarily disable third party applications and start your device. If you press on the Factory Reset button all your data will be wiped out and your phone will be Reset like it was when it came out of the box. The rest of the options are not necessary for this purpose and we will discuss about them in another post. Even using Smart Switch , the recovery is not going….